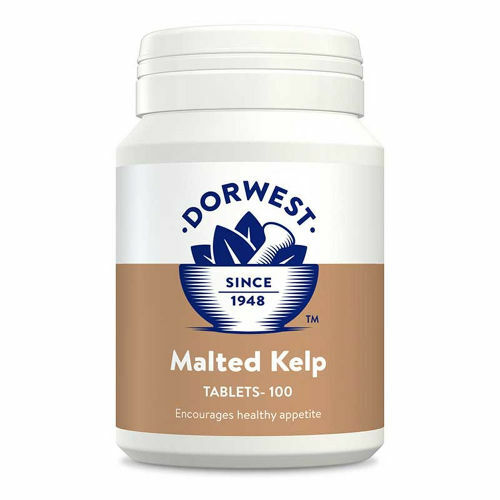 The Malted Kelp Tablets contain a combination of malt, kelp seaweed and aniseed oil is formulated to encourage and maintain a healthy metabolism. This traditional supplement containing a combination of malt, kelp seaweed and aniseed oil is formulated to encourage and maintain a good healthy appetite in both dogs and cats. The combination of ingredients is effective in inducing those with poor appetites to clear their bowls and so even fussy feeders will be helped to gain bodyweight and condition. The addition of aniseed makes it appealing to the taste buds; the inclusion of Kelp seaweed with its rich mineral content helps ensure that all micro nutrients essential for a healthy coat and pigmentation are supplied; and nutritious malt makes it ideal for convalescents and poor eaters alike. These uncoated tablets can be crushed for ease of administration and should be given half an hour before each meal.